I’ve never before ‘lost it’ at a National Tree Day event. But today I did a number just before a few pupils from Lota State School turned up at Melaleuca Park, Clifton Street, Manly West. I brought two trees for planting, both wild source: a Bunya Pine, Araucaria bidwillii, and a Queensland Bottle tree, Brachychiton rupestris. I had a camera, hat, sunblock, watering can, mattock, spade and some native plant food. I announced this to a lady council employee sporting a nice orange band around her hat. “We aren’t planting any trees”, she said “It’s policy not to use council water”. I didn’t mention that just over a week ago I saw Brisbane City Council using watering trucks to soak freshly planted Hoop Pines, Araucaria cunninghamiana, at Dutton Park. No doubt these are to dress up the near-complete multimillion dollar ‘green bridge’. I didn’t have my camera on that occasion – it was travelling around SE Qld with Jeff. “I take responsibility” said the event co-ordinator from Bayside Creeks Catchment Group (aka BEN – I’m a member) “Because in this drought it’ll be hard to keep them alive”. WHAT?! Opposite the park is a row of houses, all with taps. I had my can so carting was all that was necessary. I suggested using creek water, but they said there wasn’t any. “Couldn’t we have been asked to bring our own water?”, I asked. Hmm, that sounds dangerously like ‘networking’ and ‘planning’. I networked with residents when I ran Wandsworth Councils’ environmental tree planting programme (1987 – 89). Residents who wanted street trees had a choice of species and we made gentlemen’s agreements that they would help us to keep them watered. This was in addition to employing local contractors who regularly watered and maintained trees for the first eighteen months after planting. Hmm, that sounds dangerously like a council providing mutually beneficial services for tree huggers, local businesses while boosting real estate prices: “Dedicated to a better Brisbane” our mayor calls it. “Anyway you can’t plant those two tree species here”, said the council lady, “They’re not local natives”. WHAT?! When did the council make this decree? Brisbane’s streets and parks and bushland, including reserves that BEN care for, include vast numbers of exotic and native weed trees and shrubs. Many are Weeds of National Significance (WONS) and weeds that Council are supposed to be controlling under various acts of parliament. 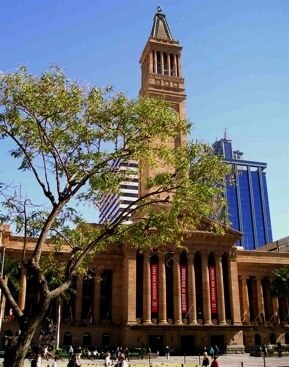 The Pride of Bolivia tree, Tipuana tipu is one such WONS that grows opposite Town Hall. Brisbane City Council really needs a curator – I’m available at reasonable rates. “And you can’t plant Bunya Pines, they drop heavy cones”, she added. WHAT?! Obviously you shouldn’t plant them over roads, buildings and car parks where their cones (which can weigh 5 or more kilos) can cause damage, but you wouldn’t waste such a useful, productive tree in those dreary municipal landscapes anyway. When I was a kid you didn’t wait for things to fall on your head…you tried knocking ‘em down so they’d hit a teacher. PE and maths teachers especially. “A Bunya-free Brisbane” – that’s plain municipal ‘risk management’ gone crazy. Now thoroughly worked up she wanted me to leave… “All I’ve been asked to do is to give the kids a talk about trees”, and then they arrived – dutifully on time – so off she toddled to talk trees. Right next to a nice new rainwater tank connected to the roof of a council shelter. But you can’t use council water, can you? Gathered under that shelter there was a nice view of the trees growing around them. The fact that there were trees growing there at all was due to the work of Marion, a retired gardener and BEN member. “Planting these trees and trying to keep this part of the Creek weed-free broke my back”, she said. “The council are good enough to provide lots of free mulch for weed control, but we’re all past shifting it”. Right on cue a council truck drove up and dumped another load of mulch by the creek, driving over the dust-dry grass in the fenced off part of the reserve. Those Eucalypt roots must love growing in such truck compacted soil…it makes absorbing rain that much harder. I mentioned to Marion that a local ‘Boys Town Project’ for ‘at-risk’ 15 -17 year old boys without a HSC or a trade might be a good source of free labour. All it would take would be a few barrows and kids could shovel it – Marion could just say where and how much. More networking, but isn’t that what council provided social services are paid to do? I left Marion a Bunya Pine so she could plant it with the other – already growing by the creek, desperate for a video camera to capture this vignette of schizophrenic council policies and the impact they’re having in the real world. The council lady is lost – infected by municipal atrophy syndrome. The kids too may be lost – I hope they don’t think that all National Tree Day means is a talk in the park. Plant type: large, winter deciduous shade tree. Habit: Fast growing, upright habit, eventually producing a flattened crown. Reaches 30m where there’s adequate moisture. Preferred climate: seedlings need protection from hard frosts of -4C, but once established they accept frost. Zones 9-11 (see ABC ‘Flora’, Page 15). Naturally occurs in northern S. America which experience dry winters and wet summers. In cultivation it adapts to wet winters and dry summers (eg as found in south west WA). Foliage: pinnate – typical of legumes. Foliage can be browned off by extremely hot, dry winds (as observed in Sydney one very windy afternoon of 40C). Seeds: winged, (resembling those of maples), so they travel short distances from parent plants. Wind dispersed. Produced in large quantities and germinate readily. Flowers: yellow-orange, in racemes held at branch tips. Massed flowering in mid to late spring. Falling flowers carpet the ground (like jacaranda). Roots: spread widely and can readily invade leaking sewage/ irrigation lines. Pest and disease problems: trouble-free, but can succumb to fungal root rots if trees are old or growing in poorly drained sites. Salt-tolerance: tolerant of slightly to moderately saline soils. At the reserve in Lota where we will be filming saplings grow on the borders of mangroves around the spring high tide mark. Widely grown – planted for shade and ornament in large gardens and farms in WA, NSW, NT, Qld. Can be grown in coastal Vic, although I have not seen them. Timber useful and foliage used as stock fodder. This tree’s ability to set and disperse seed and their capacity to germinate rank this otherwise useful sounding tree to be a potential weed. Most gardeners with experience maintaining them (colleagues of mine in WA, NSW & Qld) have observed these trees spreading, creating a lot of hand weeding. Left to their own devices these trees can create thick groves over time. Collecting and destroying seed is not really feasible because so many are produced and the effort that this would require. I’d recommend avoiding planting this species. The worst place you could grow them would be near bushland or where land is infrequently maintained, such as the reserve in Lota (Brisbane), our filming location. The principle of ‘good stewardship’ should be applied – remove the tree. Suggested alternative: Peanut Tree, Sterculia quadrifida, semi-deciduous or deciduous, rarely grown outside botanic gardens.. The report doesn’t mention that older specimens exist in botanic gardens. …”serious threat to native plants”. Filming location: Bill Laymond Park, Andrew St, Lota, Brisbane. UBD reference page 163, grid 12 P.